Is your big toe causing you discomfort? Learn about how we diagnose the problem and treat it. Hallux Limitus is a progressive condition of the big toe joint, that reduces the range of movement needed for walking in the “toe off” phase of gait, causing a stiff and painful big toe. 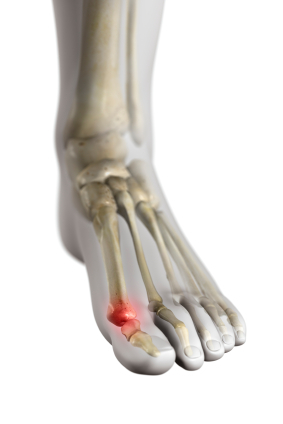 Hallux Rigidus is the total absence of upward movement of the big toe. The stiff and painful big toe becomes progressively worse. This condition can occur as a result of sporting injuries and is frequently seen in younger adults, but may also present in the older population as an age related change, as it is essentially a type of osteoarthritis. Trauma or repetative injuries (stubbing the toe, turf toe). Wearing unsuitable footwear or frequent wear of high heels. Structural or functional abnormalities, including excessively flat or high arched feet, excessive pronation (rolling in of the feet), an elevated or an abnormally long 1st metatarsal (big toe bone). Pain, swelling, stiffness and crunching in the big toe, especially after activity. Loss of joint space and osteophytes (bone spurring) evident of X-ray. Reduced functional hallux limitus test (preformed by podiatrist). Gait changes associated with this reduced range of motion (assessed by the podiatrist). Joint manipulation (preformed and demonstrated by the podiatrist). Joint immobilisation (for end stage hallux rigidus). Alter running techniques and daily regimes if necessary. Appropriate fitting footwear and shoe therapy (i.e rocker bottom soles/ carbon foot plates. Orthotic therapy to correct biomechanical abnormalities (may include casting with plantar flexion 1st ray, 1st ray cut outs, Morton’s extensions etc.) which will depend on clinical signs and symptoms. Well Heeled Podiatry can diagnose your foot pain with a thorough clinical history and gait analysis. Your foot posture and function will be assessed and the reason for you pain and symptoms will be discussed with you in detail, providing you with the best evidence based treatments available.